My Big Guy has several sensory issues, for many years he's struggled with minor drooling & chewing, it seemed like he was always chewing on his shirt collar & in the winter would chew on his shirt sleeves. It used to drive me crazy, however he did so great this past summer & didn't chew on his shirt at all, then bam, when he returned to school in August, he started chewing on his shirt again, I knew we had to try something else! I've heard great things about Chewbeads products, so when I was recently introduced to Juniorbeads by Chewbeads, I knew I had to personally check out some of their products for Big Brother C! 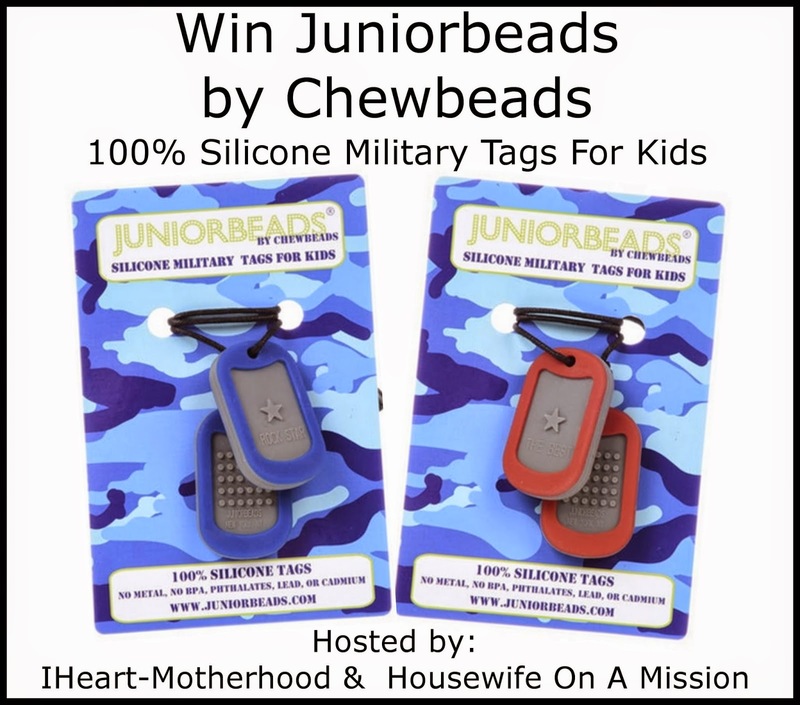 I was sent a red & blue Juniorbeads Dog Tag, these military tags for kids are 100% silicone jewelry that is colorful, chic & free of unwanted chemicals. These Dog Tags contain no BPA, phthalates, cadmium, lead or metals, they can easily be cleaned & are also dishwasher safe. The necklaces feature a breakaway clasp for added safety & are ideal for children ages 3 & up! Big Brother C typically keeps his chewies in the freezer, so once his new Dog Tags were cold, I took the RockStar one & put it around his neck. At first he wasn't sure but it didn't take long for him to put the tag in his mouth, it's such a great alternative then chewing on his clothing! 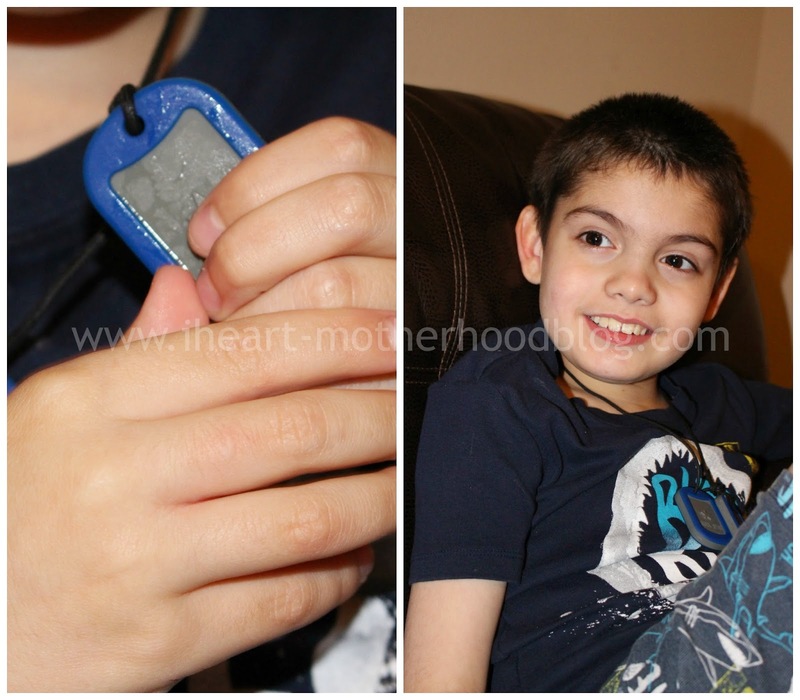 Do you have a child who could benefit from these dog tags? Buy it: Purchase your own Dog Tag Juniorbeads by Chewbeads online for $14.50 each! Win it: One luck reader will win Juniorbeads by Chewbeads Dog Tags! As with all jewelry, teething products & so on, adult supervision is suggested & the clasps on these necklaces are not made for chewing, just the tags themselves! I'd also love the Skinny Charles Bangle in Creamsicle! I love all of them but the mulberry necklace would be the one I would grab! Also I love the pacifier tethers. The dog tags are my favorite (my navy husband's, too), but I'd also get the Yankees teether or beads.